MicroNeedling, also called Medical Skin Needling or Collagen Induction Therapy (CIT) is an aesthetic medical procedure that involves repeatedly puncturing the skin with tiny, sterile needles (microneedling the skin) in order to induce production of new collagen ie the skin plumps and thickens in response to the microneedling. 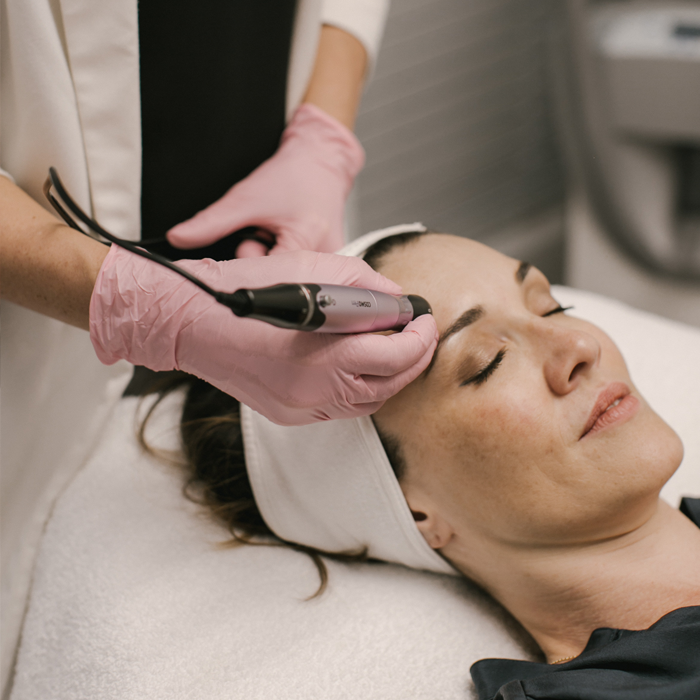 This non-ablative treatment allows us to treat the deeper parts of the skin without removing the top layer of skin. It is designed to treat various skin conditions such as fine lines and wrinkles, large pores, light to moderate scarring from acne and photo damage, and to improve skin colour and other skin texture changes. The number of treatments depends on the skin condition being treated and the extent of damage. Most people will begin to see benefits even after first treatment with consecutive treatments spaced every 4-6 weeks. For collagen induction and minor skin textural issues we recommend a series of 3 treatments. More severe cases of acne scarring or deeper static wrinkles 3 to 6 sessions are normally required. A topical anesthetic is applied to the skin prior to treatment to reduce discomfort and the procedure is pain-free. The depth and speed of the procedure is individual per patient issues. We needle with a powerful epidermal growth factor serum to obtain the best results possible. While these micro channels in your skin are open and in an intensified wound-healing state, the epidermal growth serum aids in repair and remodelling of the dermis. The downtime post-procedure is minimal, typically a patient may experience redness and minor swelling for 12 to 48 hours afterward, akin to a minor sunburn. Usually you will notice some improvement in the texture, tone and vitality of your skin after the the first or second treatment. More significant results will occur after 4 to 6 treatments spaced 3-4 weeks apart. Collagen remodelling takes place over time. Skin will continue to improve over the next 6 to 12 months post treatment with proper home care regimen. Microneedling creates permanent and dramatic reparative changes to skin, results will vary in each patient.